Thought I would set up a special topic for this major development. I really like it. I think the darker cladding works better here than on the Customhouse Street development given the additional glazing, the paler, lower elements, and oddly, the more blocky robust shape. I think this is definitely aimed at HMRC - 3,600 staff is, I think, what HMRC plan to base in Cardiff (not sure where the 5,000 figure comes from). I reckon there is quite intense competition between JR Smart with this development, and Rightacres, with "the Interchange" to bag HMRC. I imagine Rightacres are selling their incredibly well connected location, directly adjacent to or above the main public transport nodes of the city. JR Smart will be selling a lower rental cost. Its interesting that both Central Square and Capital Quarter have been doing well, despite quite different strategies. Central Square has been positioning itself as the best located, highest spec, location - and hence going for premium rents of up to £25 a square foot. 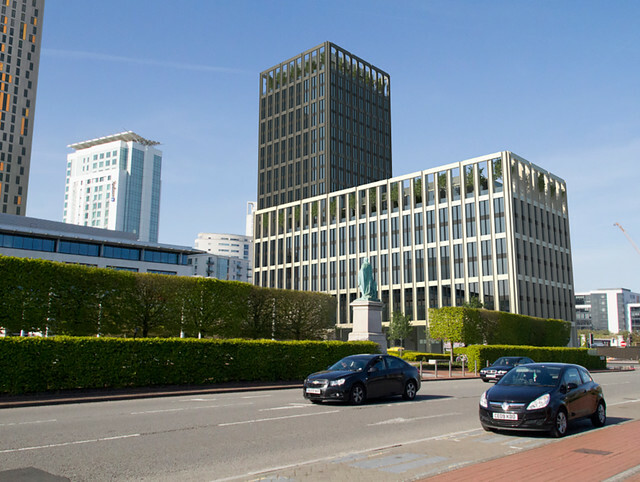 At least until now, JR Smart has been making do with around £19 - 20 at Capital Quarter, going for occupiers who want modern, flexible, well-specified space, albeit a bit further away from transport, and not quite so "nice". Both have been successful. My money is on JR Smart bagging HMRC for this site though. I think Central Square is probably strong enough that Rightacres would not feel obliged to compete too hard on rents. They can always pare their office element back and boost their residential and/or hotel element - options less attractive on this site, I'd imagine. And I think HMRC if being asked to pay say £23 at central square, or £19 at John Street would pick the latter. £4 a square foot on 300,000 is £1.2 million a year - not to be sniffed at! Yes indeed I think this is very worthy of its own thread! I wonder, is a timescale mentioned in planning apps that I've missed. Obviously planning permission will be required - not sure when that is booked in for? Given the size of this development are we looking at 24 months + construction. If it is for HMRC then 2019 has been mentioned for the move to city centre so maybe early 2017 start? i would imagine a development of this size would have had significant pre-app discussions so any issues have already been resolved. I'd suggest the statutory 8 weeks is all this needs to get through with a start towards the end of 2016. it does look good and I'd say its the type of office that CSQ requires to give it that CBD feel. lets hope we have a few quirky bars in the arches too! I think JR Smart must have an occupier in mind. Any speculative builds would be on Capital Quarter surely, where they already have permission, the masterplan and doen the ground works. I like the way that it starts to enclose Callaghan Square. It would have been nice if No 1 and 2 CS were a bit taller mind. I hope that CS south side, whenever that gets built also has a bit of height so that it at least looks a bit urban eb=ven if it will never actiually be a square as such. A reconfiguration of the traffic layout wouldn't go amiss either - I'm sure there was a plan for that a little while ago but nothing seems to have happened. I was thinking that we really ought to see this as an extension of Callaghan Sq. Much more so than part of Capital Quarter. I'd be very surprised if it wasn't Her Majesty's REVENUE and CUSTOMS (just to correct a previous remark) who are taking it. It even looks like their current building and the timing seems to fit. Frank wrote: I was thinking that we really ought to see this as an extension of Callaghan Sq. Much more so than part of Capital Quarter. I'd be very surprised if it wasn't Her Majesty's REVENUE and CUSTOMS (just to correct a previous remark) who are taking it. It even looks like their current building and the timing seems to fit. How big does this development need to be for walesonline think it's worthy of some space!! One of two reasons Paul I reckon. They either just don't know, and clearly don't pay attention to what's going on or they know and are sitting on an article waiting on JR Smart, and hopefully for a HMRC announcement to go with the story. JR Smart themselves don't seem to have publicised it either because the insider media article is only quoting things from the planning application documents. Saying that JR Smart's own website and the seperate Capital Quarter website aren't exactly updated often! Kyle wrote: One of two reasons Paul I reckon. Yes you're probably right, and in all fairness I'm waiting for the story to appear as they will presumably have more info on whether this is for HMRC (which lets face it, it is) and some indication of timescale. I suppose that at this moment it's kind of just half a story. That said even half a story in this case would normally be worthy of a front page graphic! it hasn't stopped them before!! paul cardiffwalesmap wrote: How big does this development need to be for walesonline think it's worthy of some space! !